Slideshows made from your own photographs or videos can be great tools for sharing information, marketing your company, creating family memories--or simply great fun. This is especially true now that it's so easy to share them in so many ways: on the Web, ever e-mail, on discs, or to show them in meetings using your computer and an attached large screen. The key is the right program for creating these slideshows. We found that Photodex's ProShow Gold ($70, 15-day free trial with watermarks) delivers smooth, sophisticated multimedia slideshows, with an emphasis on still photos--though you can use video, too. ProShow Gold provides a slew of multimedia options to move your slides across the screen and create an entertaining, creative slide show. ProShow Gold uses a rather intelligent interface that isn't difficult to master, but it doesn't sacrifice functionality to accessibility. Simply drag and drop your photos into the timeline slots. Then, the fun begins. You can add transitions, music, motion and image effects, backgrounds and textures, moving text--a whole slew of options to move your slides across the screen and create an entertaining, creative and/or informative slide show. ProShow Gold's output options cover a wide range. They include burning DVD or Blu-Ray discs that can hold multiple slideshows (with professional-looking menus and an autorun exe, if you wish); upload to YouTube or your own Website; share for free on vendor Photodex's Web site,; or even run on a cell phone, MP3 player, and other devices. For those whose slide shows consist primarily of still images (with perhaps some video included), ProShow Gold offers a wide range of tools to create and share a fully personalized, attractive show. For those users who want even more control, you might want to take a look at its big brother ProShow Producer ($250), which includes more features and effects, including professional-oriented options, such as copyright, branding and color profile awareness. Note: The trial/demo download version places a watermark on any output. 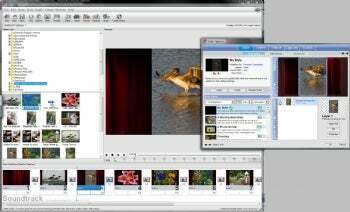 However, you'll be able to save your slideshow and re-output it without a watermark, if you buy the license. Any new slideshows created in the full version will not have watermarks.